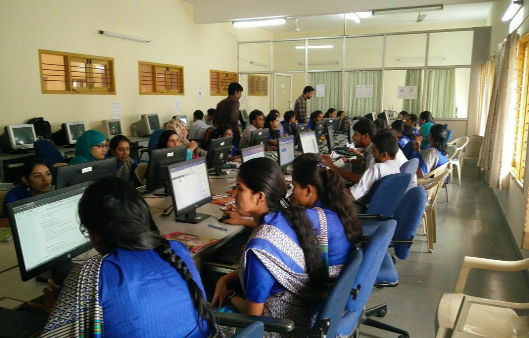 Centre for Education and Technology, IT for Change are designing and transacting a “Technology integrated learning” course for student teachers of the Bachelors in Education course at Vijaya Teachers College, Bengaluru. This is the first B.Ed. course based on the National ICT Curriculum, 2013 of Central Institute of Education Technology (CIET), NCERT. The course was transacted during 2017-18 for the first two semesters of the 2018-20 cohort of student teachers. During 2018-19, ITfC is transacting the course for the third semester of the same cohort, where the focus is mainly on practice teaching. The semester 1 cohort is being taught by the Vijaya College faculty, with support from ITfC. ICT syllabi in school education and teacher education have in the past largely focused on the learning of few popular proprietary software applications. This has had little impact on the learning processes or outcomes. The National ICT Curriculum pioneers a new approach to ICT learning and ICT based learning, with the six themes of “Connecting with the World”, “Connecting with Each Other”, “Creating with ICT”, “Interacting with ICT”, “ICT and teaching-learning” and “Reaching Out and Bridging Divides”. The curriculum broadly attempts to build ICT competencies in teachers, to strengthen their professional capacities and to use ICT tools in their teaching. It enables students to acquire digital literacy and vocational skills and improve their subject learning. The Centre for Education and Technology developed the syllabus and course content for the students of the B.Ed program being offered by the Vijaya Teachers College for the 2017-19 batch. The Technology integrated learning course is being offered on the Free and Open Source Learning Management System Moodle. During 2018-19, the student teachers, as a part of their Semester 3 work, are learning to integrate ICT in their practice teaching in high schools and higher primary schools. They are preparing lessons plans in the methods that they are studying and transacting the same in the schools as a part of their practice teaching. The new cohort of students (Semester 1) are learning the 'Technology Integrated Learning' course from their own college faculty with support from ITfC. A similar certificate course on 'Integrating ICT in teacher education' has also been designed by IT for Change, for faculty in the B.Ed. colleges of Bengaluru.